True North: Faith In Fishing features David Boyd, a man on a mission, on Monday 28 January at 10.40pm on BBC One Northern Ireland. A successful businessman, David hopes to return to Portavogie to the ‘good old days’ of the ‘70s and ‘80s white fish boom, by developing new markets for the large coldwater prawn of ‘langoustine’, a high-value luxury food. The fishing industry in Portavogie has been on its knees, but any student of history will know that you’ll not keep an Ulster-Scot down for long. David is buying new boats and trying to encourage young people to stay in the area and join the fishing fleet. Portavogie needs a saviour, and through a mixture of faith, political upheaval and determination it may just have found one. 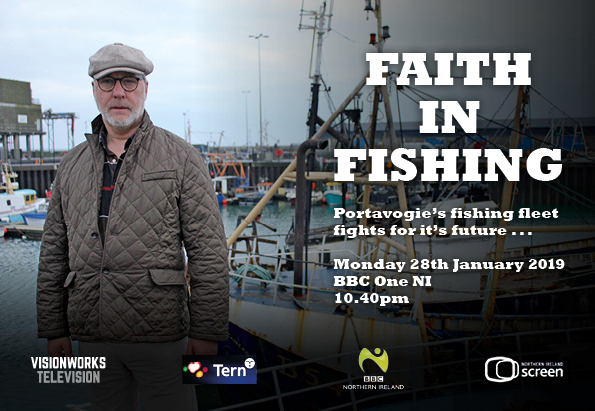 True North: Faith In Fishing is a Visionworks Television and Tern TV Co production for BBC NI, with support from Northern Ireland Screen’s Ulster-Scots Broadcast Fund.